German driveline and chassis technology company ZF has sealed a US$7 billion (A$10 billion) deal to buy US braking specialist and long-term collaborator Wabco, the pair have revealed. ZF casts the meeting of management minds between two as part of its Next Generation Mobility strategy aimed at commercial vehicle, connectivity, automation and electric propulsion. This is a logic Wabco endorses. "Joining forces with highly respected ZF will create a leading global technology company well positioned to capitalise on future demand for autonomous, efficient and connected commercial vehicles," Wabco chairman and CEO Jacques Esculier says. Esculier adds that the logic of innovation presently demands increasingly more resources. "It has become increasingly apparent that our industry will face a new level of strategic complexity and will attract new competition, including new entrants from outside the sector, able to bring unprecedented resources to the table," he says. "This demands Wabco make critical choices in the role it will play in the future industry value chain. "Furthermore, it is anticipated that significant in house investment and new alliances will be necessary to address the full scope of required technologies for these new domains. "Considering these factors, we strongly believe this is the appropriate moment to be joining forces with ZF, providing access to critical technology and the global size and scale to de-risk the return on investment required as the industry transforms. And as a result it will realize certainty of value and liquidity for our shareholders." In explaining its reasoning for the deal, ZF says Wabco will expand its expertise to include commercial vehicle braking solutions for the first time. "This plays a central role for the control of automated driving functions – including emergency braking manoeuvres of trucks and trailers,"
"Following the acquisition, customers of both companies will have a partner in ZF who can offer them a fully integrated system approach, new drive systems for e-mobility and autonomous driving functions. "ZF expects that automated driving functions will primarily be implemented for commercial vehicles and in areas with low complexity and traffic (e.g. factory sites, airports, agriculture). 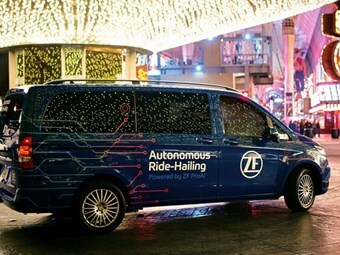 "The combination of both businesses is expected to further accelerate the development of new technologies to enable autonomous commercial vehicle functions, making ZF less dependent on the economic cycle of the passenger car industry. "The planned strategic acquisition of Wabco is consistent with ZF’s goal to develop and deliver technology solutions that make cars and commercial vehicles see, think and act in order to reduce emissions and increase road safety. "While ZF already has sensor systems and computing technology for its ‘see’ and ‘think’ competence, together with Wabco, ZF will in future be completing the portfolio for commercial vehicle technologies to offer solutions to allow vehicles to ‘act’. "ZF is already a leading supplier in the area of steering and driveline technology." The transaction is subject to regulatory approvals, closing conditions and shareholder approval with more than 50 per cent of Wabco’s outstanding shares. ZF expects to close the transaction early next year.